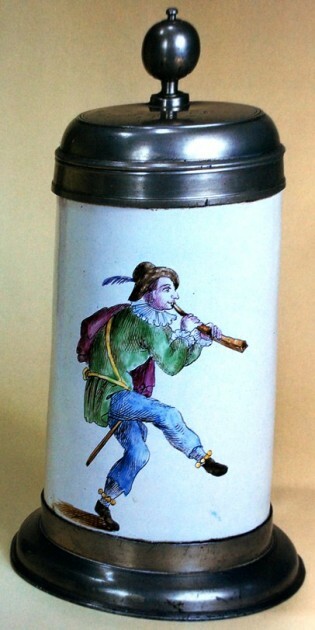 The Proskau factory produced faience wares for about 25 years from 1769 until 1793. Due to their decoration method, this factory is one of the easier faience factories to identify. I will start by discussing the stein body, then handle, then marks and finally the decoration method. 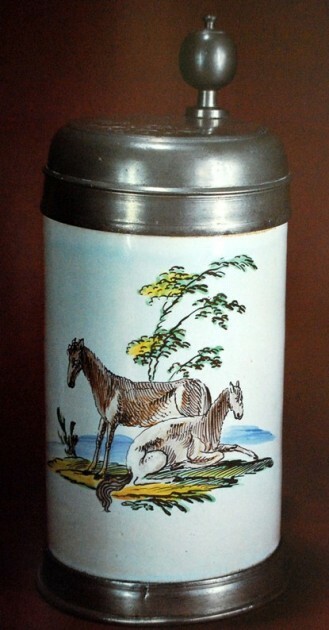 Figure 1 shows a typical Proskau tankard with the pewter base removed. 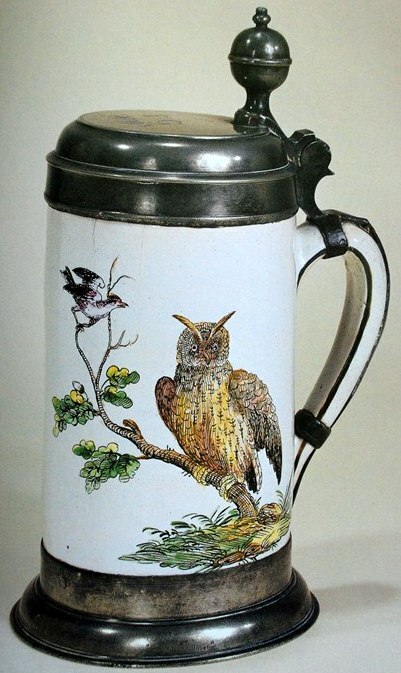 Most Proskau steins are the tankard or walzenkrug shape. The top lip is indented for the pewter lid ring to fit and the bottom is slightly different than the typical straight side that you find on north German faience factories. 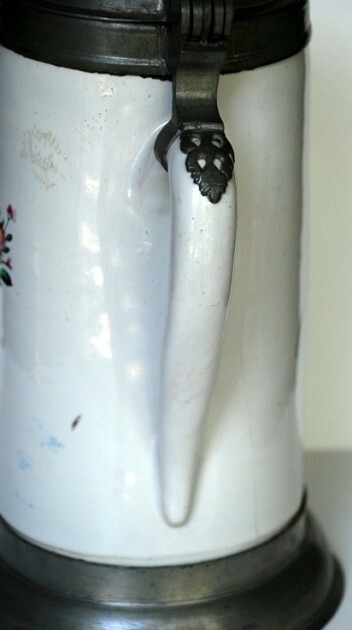 Note that the base of the stein has a slight indentation where the pewter base fits around the bottom of the stein. This indentation can usually be seen even with the pewter base in place, as shown in Figure 2. The Proskau handle is shown in Figure 3 and Figure 4. The handle has a cross-section in the shape of a D, being flat on the inside and rounded on the outside with rounded edges where the handle transitions from round shape to flat. There is a taper from top to bottom. 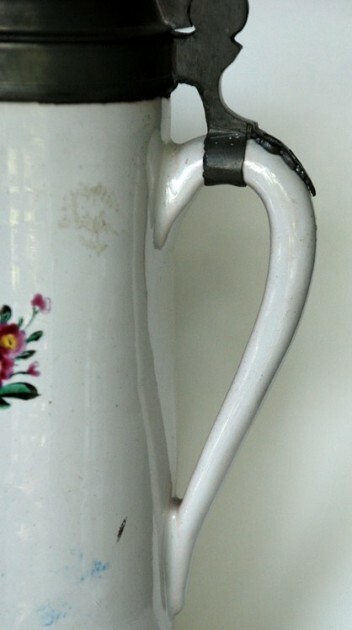 The handle is attached to the stein body near the top and the bottom of the stein, making a long handle, as shown in the side view shown in Figure 4. The lower handle attachment has a rounded tapered tail. 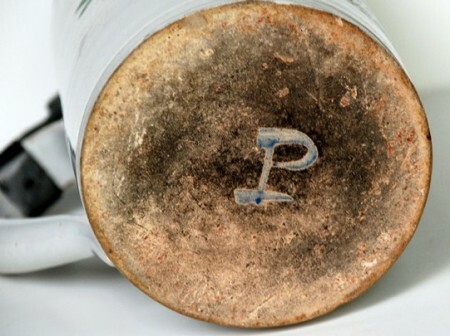 There were several factory marks used on Proskau pieces, which include a cursive P or Po, an underlined P, or a cursive D P. Figure 5 shows these marks, which are taken from the book Fayencen by Gert Nagel and Figure 6 is of an actual mark on the bottom of one of my Proskau steins. 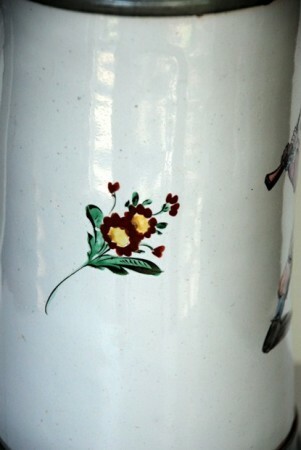 Proskau steins are decorated with a center scene on the front of the stein and usually a small floral decoration on each side as shown below in Figure 7. 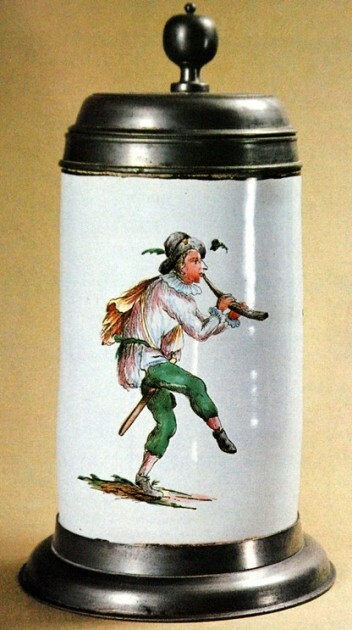 But it is how these decorations were made that sets these steins apart from most other faience factories. 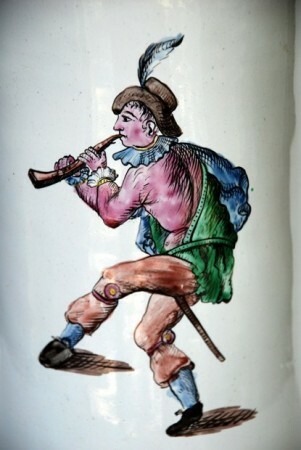 While most faience steins were fired twice (as described in [PROSIT] in part 1 of this series), the Proskau faience piece went through three firings. Once the body was thrown and the handle attached, the stein was fired the first time to about 700 ℃, which drove off the water and left a hard porous body. The stein was then dipped in a tin oxide glaze (tin oxide, powdered glass and a flux) and fired a second time to about 1000℃. 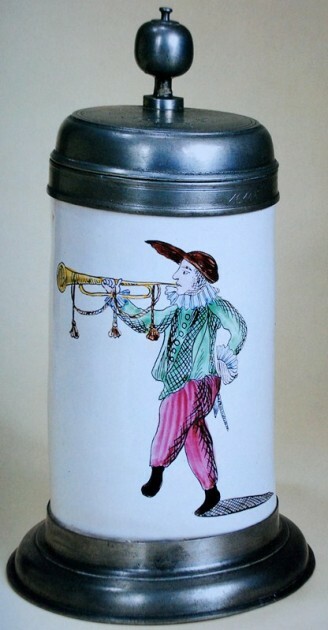 This produced a smooth white enamel finish and this surface was then decorated with low temperature paints, in which a larger color pallet could be used. 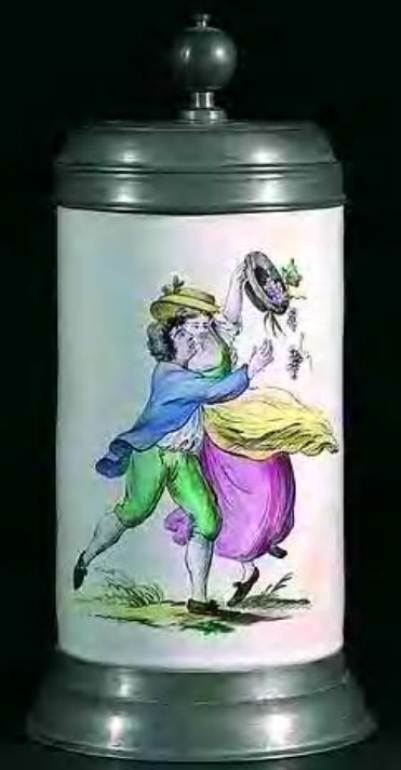 This made for a more colorful decoration on the steins. 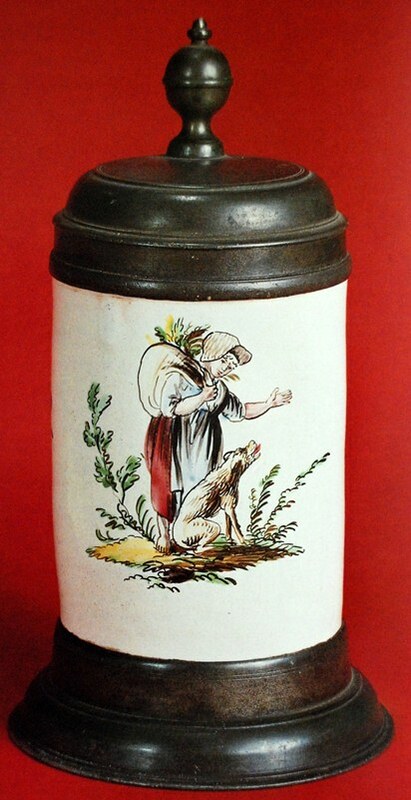 The stein was then fired a third time to about 750℃. Often fired at the same time as the second firing temperature of 1000℃, these pieces were set behind muffle bricks to protect them from the higher temperature. 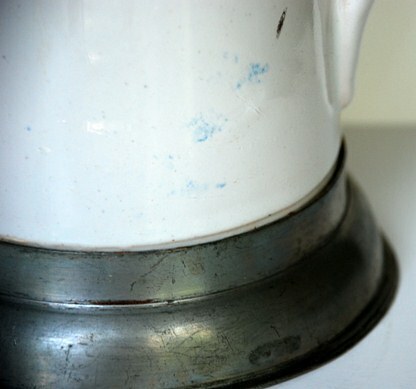 This muffle-fired decoration now appears over the white background glaze and gives some depth to the decoration as shown in the closed up shown in Figure 8. BELOW, At the end of this article are: more photos featuring Proskau steins, some with the musician theme and some with the various other scenes that can be found. This scene is of the God Hercules, always with his club. NOTE: This article first appeared in “PROSIT,” Vol. 2, No. 80, December 2011. It and its photos are reproduced here by permission of the author William Hamer, a close friend of mine. Those photos are very well done considering some came from auction catalogs! A really great job Bill.